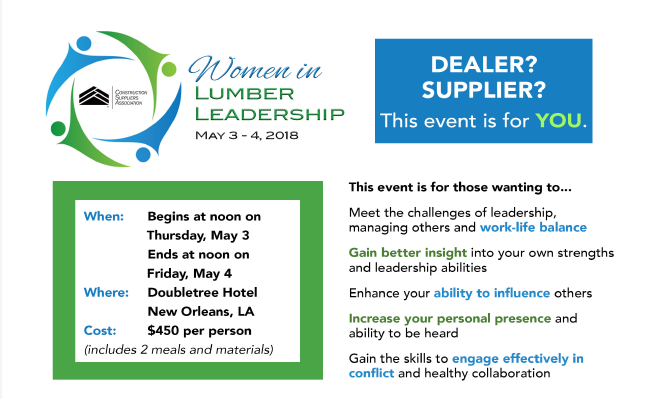 CSA is once again pleased to offer the Women in Lumber Leadership workshop, May 3 - 4 at the Doubletree Hotel in New Orleans, Louisiana. With an expanded focus that includes insights into how our own personality traits affect how we relate to others, this year's meeting will help women in our male-dominated industry better communicate and be a leader in the workplace. Open to both dealer members and suppliers, this event is a must-attend for anyone looking to be a more effective and inclusive leader in their daily life.